with all the other pugs. She is a very gentle dog. which should aid in her breathing. 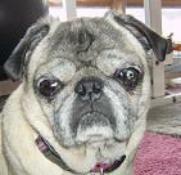 We plan to haver her rotted teeth removed at that time also. Her surgery is scheduled for Feb. 21st. Info. will be updated after her surgery. do not have an estimate on this surgery yet. When we do her info. will be updated. 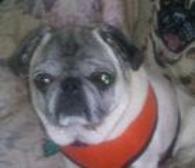 PA Pugs is an IRS 501c3 tax emexpt rescue organization. small, would be greatly appreciated. If you'd like to make a donation using paypal to help Noel, please click on the "make a donation"
Needs is an IRS 501(c)3 tax emexpt rescue organization. Breathing issues, collasped trachea, elongated epiglotis. Loves to cuddle. Gets along with children & other pets. Very friendly.